My words following my father’s death were far more clumsy, less sure of the reality of what had just happened to my family. But there was a similarity in our account of not understanding how someone we loved could choose to leave us. The legacy of suicide in a nutshell. The tabloids roared, “Zelda forced from Twitter” and “Cyber bullying back in the news” but we know that all of these things have been around for a long time…I have yet to attend a suicide that didn’t force someone out of something – comfort zones, dreams, beloved roles, Suburbia, and on and on. Suicide is a death of a thousand people. No one truly makes it out alive all the way. Any survivor will tell you that parts of you die when you experience suicide. We were just simply not made to reconcile death as a choice. Our instinct is to survive, although given a moment to really ponder it, you will realize that suicide too is simply a way for someone to survive, particularly when the alternative is worse than death. Maybe you can’t know what that means right now but the reality is for some people, life is a very painful experience. Count yourself lucky if you don’t understand it. Most people don’t know this but someone wrote “murderer” across my garage door after my dad died. It was the olden days version of cyber bullying. This is a very high profile situation but go to any funeral home after a suicide, you’ll see all the same stuff happening. It makes sense, if people are unable to reconcile that suicide could be a choice to die, then there has to be a “reason” they choose to die. It levels out people’s anxiety if there is a black and white reason. 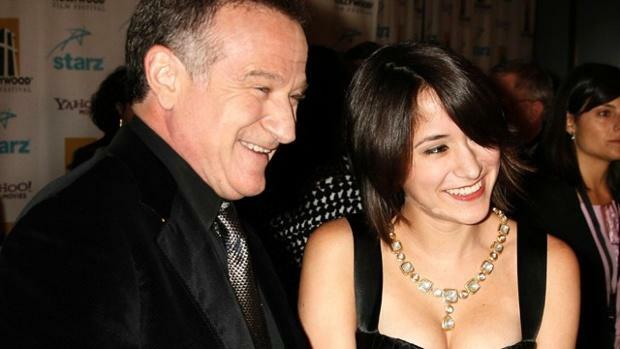 I heard on the radio the other day that it was being rumoured that Robin Williams was having financial troubles – AHA! A reason! That makes more sense to people than someone wanting to die. Another good reason is some other person must have wronged him, missed the signs, failed at their protective job. If you can’t reconcile someone’s choice to die, then surely it would be easier to understand if there was some antithesis, some antagonist that caused the thoughts of death. It’s more logical. It fits better into the puzzle pieces of the world. But it’s wrong. And Zelda got that right away. My guess is she wasn’t so much as forced as making her own choice. She does not have to be a party to people’s ignorance. She did not write a rebuttal, she wrote a reckoning of what often characterizes those early days of death – I miss him, I don’t understand but here are some things I know for sure. She was righting herself, finding her feet in what will be a very difficult balancing act for many years to come. The exodus from nay-sayers is her survival. And a very graceful one at that. If there was anything I could say to Zelda, from one daughter to another, it would simply be this: No one asks to be a spokesperson for suicide. No one plays with Barbies when they are young and hopes they will be a great advocate for themselves and their loved ones in the wake of such a tragedy but yet here you are, forced out of Twitter and forced into the spotlight at a time when the light must be very bright and very cutting indeed. Even after 18 years past my own Father’s suicide, I feel it keenly, the heaviness that I would not wish on my worst enemy and I am grateful for the light you beam back to all of us, reminding us we did the best we could and have impacted at least those closest to us to learn a little something different about suicide and depression. I rest easy in the knowledge that anyone who knows me at all, knows the devastating impact suicide has, both by the death itself and the reactions that society at large has about it. One woman told me in her best intentions, that she did not believe my Dad would really go to hell because he killed himself. She meant it I believe, as a comfort. Maybe she kicked herself later for saying it. Maybe she patted herself on the back for bringing that to light. I will never know. It stuck with me for a long time though. It proved to me the power of words and I have tried my best not to throw them around carelessly ever since. But trust me when I tell you, I did not come to appreciate the “lesson” of it for many years. You have my respect and my sympathies Zelda. Thank you for sharing it even though you didn’t need to.